Enjoy the world-famous taste of Starbuzz Shisha! Starbuzz is one of the world's most popular brands of hookah flavored tobacco. Starbuzz remains on top by sticking to a mix of flavor innovation and high quality ingredients. Hookah smokers both new and experienced will love everything they have to offer. Manufactured in the USA, all the premium lines by Starbuzz Shisha are available at SouthSmoke.com in 100g and 250g sizes. Take a look and try something new from the Starbuzz Shisha for sale at SouthSmoke.com! Try the Premium line of Starbuzz Tobacco and join the biggest movement the hookah world has seen in years. Blue Mist, Code 69, Melon Blue, and Tangerine Dream make up some of Starbuzz Premium's most popular hookah flavors. But popularity isn't everything. Starbuzz rose in the ranks by offering classic fruit flavors with that trademark Starbuzz twist. From the sugary delight of Apple Cinnamon to the far-out Safari Melon Dew, there's no other manufacturer who does it like Starbuzz Tobacco. Starbuzz Bold could not have been named better. 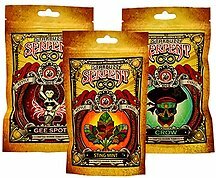 This premium blend of exotic, never-before-mixed flavors are just the thing to make your smoke sessions stand out. Starbuzz Bold offers intense flavor that shakes the very foundations of hookah tobacco. From the tangy spray of Black Peach Mist to the perfect mild sweetness of White Chai, these bold Starbuzz flavors are pushing boundaries. Impress your palate with one of these today! 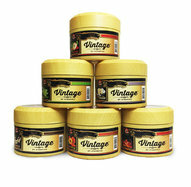 Starbuzz Vintage provides you with a robust, traditional smoke. Only experienced hookah smokers need apply! Starbuzz Vintage is mixed with a special dark, thick molasses that offers you a full yet pleasant buzz. Flavors include Dark Citrus Mint, Indian Spiced Apple, and Tiramisu, among many more. All Vintage Starbuzz flavors go the extra mile to provide you with a hookah session that's without equal. Starbuzz Vintage is available only in a 200g can to ensure you have plenty on hand to kick back and relax the Starbuzz way. 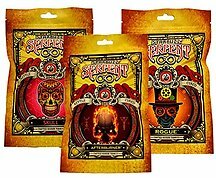 SouthSmoke.com is an exclusive authorized online dealer of Starbuzz Tobacco brand products. Come view the entire Starbuzz Tobacco flavors list on our product pages. We keep you updated with the latest and greatest flavor concoctions that Starbuzz releases. Be sure to keep checking back for new, fun flavors! We are also authorized Starbuzz Wholesale distributors. Get all your Starbuzz needs for your hookah store or smoke shop at SouthSmoke.com!